Hong Kong, 2002 Colour – 98 min. After her husband's death in a diving accident, May (Cheng) inherits a fortune. Their relationship was a very brief one: in a single week they met in the Caribbean, got married and he died. Her mother-in-law (Wong Man-wai) gives her a job in one of her companies but May is lazy, unmotivated and rude. While driving under the influence she looses control and is rendered unconscious. In a near-death experience she meets a ghost, Ken (Lau). When she wakes up in a hospital bed she realizes she is able to see the ghosts that walk amongst us. But only with her left eye. At the time were there were several rather successful horror films, including the Hong Kong production of the Pang brothers, The Eye, spreading throughout Eastern Asia, the production company Milkyway decided to make a comedy that gave a wink of an eye to the genre. The title is quite obvious as to its purposes, putting together, in a single, long and witty sentence, the two characters of The Eye's Chinese title — 見 jian (to see) and 鬼 gui (ghost). The premise and the very title of this To Kei-fung and Wai Ka-fai film take us back to a genre spoof, supported mostly on The Eye's success and mechanisms, in which a young blind woman begins to see ghosts after a surgical intervention. However that's not what happens, for the initial concept does not go beyond the premise. Here only the left eye has been operated on and May needs to close the right to confirm she is in the presence of a spirit from the other side. Amusing, right? But this is just a “joke” and is definitely not enough to sustain an entire film. May (Cheng Sau-man) at home with Ken (Lau Ching-wan) and at the office with Susan (Lee San-san). 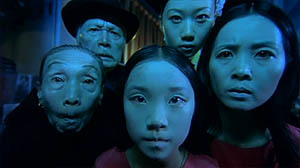 My Left Eye Sees Ghosts (a literal translation from the Chinese title), once its premise is fulfilled, turns out as just another light comedy, ordinary and with little imagination, distilling its evident lack of investment in the text, in the characters and even in direction. We shall not speak of a “failure” or nothing of that sort. To and Wai know very well what they are doing — a quick, cheap film, without much trouble and a box-office success. If our appreciation were about achieved goals, we would refer to it undoubtedly as a “good” or even “excellent” work. Horror films based on similar premises usually give us tortured main characters fighting against their recently acquired skills. Perception tends to be used at the service of some mystery that needs to be solved. Here we cannot find any structure considering that issue; there is only the starting point and a “surprise” ending. From one to the other, we see an unraveling of situations without any significance to the narrative structure and Sammi Cheng facing some ghosts including a glutton (maybe to use some extra gags from Love on a Diet, who knows?). May's father (Lam Suet) suggests the services of a psychic. Simon Yam in a special appearance. There is a factor of contrast/social conflict in the film: a young girl from a humble background goes to live with a wealthy and educated family. But her father (the ever present Lam Suet) and her brothers look like they were in the make-up room for only ten minutes and we find it difficult to place them in that environment. The widow's relationship with her husband's family is limited to a mix of tolerance and irritation in face of an outstanding lack of education and indifference. The humour is supposed to spring out of this “clash”. Sammi Cheng shows talent to create rude and “apparently” cold characters (here, in Yesterday once More and, to a lesser extent, in Love on a Diet) for whom we are supposed to feel for at the end of the film. But the truth is that it is rather difficult to feel sympathy for someone who just doesn't care; she is aggressive and rude just because, until the moment she reveals she is a very sensitive and emotional person after all. May begins to live amidst ghosts. On the left, Kelly Lin's special appearance. The absence of really funny gags and a supporting cast that just stands in (including a small role by Simon Yam Tat-wah) make My Left Eye Sees Ghosts a rather uninteresting film experience, close to unbearable on a second viewing. However if you love the actors and Cheng's romantic ballads you may not consider it a waste of time. Lau Ching-wan starred on some remarkable films of Milkyway's noir period, such as Too Many Ways to Be No. 1 (1997), The Longest Nite and A Hero Never Dies (both in 1998). It is a pity that we have not seen him recently in works that might use his (drama) skills, such as Lost in Time (2003), by Derek Yee Tung-sing, co-starring with Cecilia Cheung Pak-chi. DVD released in Hong Kong by Mei Ah (R0). Anamorphic transfer, Dolby 5.1 and dts tracks. Extras: Trailer, Interviews (Sammi Cheng, Lau Ching-wan and Lee San-san/Cherrie In/Kelly Lin), Data Bank (synopsis and main credits), Best Buy (“Anita Mui Fantasy Gig 2002”, Feel 100% and Mighty Baby) and Glossary (three text entries). The interviews do not amount ten minutes including just the basic sound bites “in this film my character is —”. Both the interviews and the text are translated into English.